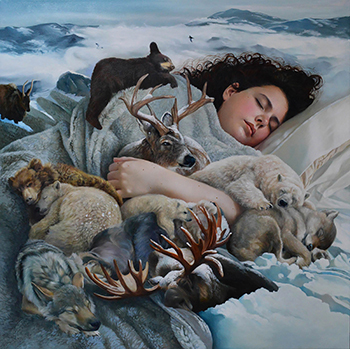 Hibernation, oil on canvas, 36" x 36", 2017. Hanger, Oil on linen, 38” x 24”, 2018. Couple (GZ1), Oil on canvas, 60" x 60”, 2018. A Dark Kind of Angel, Oil, 12” x 16”, 2018. Yukine in Moonlight, Oil, 5' x 7', 2018. 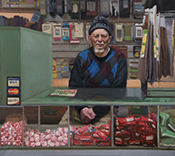 Bodega, Oil on linen, 48" x 54", 2017. I Woke Up Like This, Oil on canvas, 48" x 60", 2017. Thank you for the Worthless Day, Acrylic and oil on canvas, 96” x 48”, 2015. Some Place We Said We’d Go, Oil on canvas, 48” x 72”, 2017. Contemporary Artist, Oil on canvas, 48" x 60", 2017.